2011 growth surprise & 2012 growth bust? Now that the FOMC meeting and Bernanke's first press conference is over, one of the questions that has been nagging at me is whether the Fed might over-react to the recent bout of economic growth. More importantly, is the growth self-sustaining? I came upon an intriguing point of view from Lombard Street Research (LSR). I have been very impressed by these folks as top-down forecasters for their non-consensus out-of-the-box thinking. The most memorable, for me, was their call after the Tech Bust to watch China as a source of global growth when few forecasters were even thinking about the Middle Kingdom. [T]he chief danger is a large boost to 2011 business capital spending arising from 100% first-year depreciation this year only, and then, with its end-year withdrawal, a very sharp downswing in 2012. This Review posits the chance that 2% of 2012 GDP could be brought forward into 2011 to gain the tax break, and that its bunching at end-year could boost GDP growth to 7% in 2011 Q4 from 2010 Q4. But the loss of that spending in 2012 would doubly reduce cap-ex next year, maybe causing recession. In addition, the build-up of accelerated cap-ex this summer could remove much of the cash flow surplus that businesses are currently pouring into financial markets, at the same time as the end of QE2 takes away the current $100 billion/ month of Fed inflows. This liquidity squeeze would end the stock market recovery. This LSR analysis is highly intriguing. Indeed Mr. Market seems to have recognized the capex story. The ratio of Industrial stocks, the sector where most of the capital equipment companies are, are in a well-defined uptrend relative to the market. What if the Fed overreacts? What nags at me is the Fed reaction. What if the Fed interprets this growth spurt as a self-sustaining recovery and ends ZIRP prematurely? The resulting tightening effects would start to bite in 2012 and coincide with the capital spending slowdown. If the capital markets look ahead 6-12 months, it would start to anticipate a growth slowdown starting about 3Q, which is also the timeframe for the end of QE2 and discussions about the end of ZIRP. I am already seeing worrisome negative divergences in the market, which should concern the bulls. My inner trader believes that there is still some limited upside to stocks, which he wants to stick around for. One of the important "tells" would be to watch for a downturn in the relative performance of the Industrials to the market shown in the chart above. My inner investor, on the other hand, is preparing for the storm to come. Its magnitude is unknown because it is highly policy dependent. As the markets hold their collective breaths and wait for the FOMC April 27 statement and subsequent Bernanke press conference, it seems that the end of QE2 is baked into the cake. The question is more one of what happens to ZIRP? In our view, quantitative easing has been a reckless policy, not only because it has fueled what Dallas Fed president Richard Fisher calls "extraordinary speculative activity," but because aside from a burst of short-term optimism, the historical evidence is clear that fluctuations in stock prices have very little impact on real spending (the so-called wealth effect is on the order of 0.03-0.05% for every 1% change in stock prices). People consume off of perceived permanent income, not off of fluctuations in the prices of volatile assets. Now, it's true that QE2 has probably been good for a fraction of 1% in additional GDP, which should be sustained over a period of a year or two, and though we haven't observed real activity or actual industrial production that matches the optimism of survey-based measures such as the ISM indices, it's clear that some pent-up demand was released. Still, the links between monetary base expansion, stock values, and GDP growth are tenuous at best. The most predictable outcome was commodity hoarding, where our expectations have been fully realized, with awful consequences for the world's poor, not to mention for geopolitical stability. As regular readers know, I use the Inflation Deflation Timer Model, which depends on commodity prices as the canaries in the coal mine of global growth and asset inflationary expectations, to time the risk-on vs. risk-off trade. Russ Winter pointed out that there has been a close correlation between the expansion of the Fed balance sheet and commodity prices. With the end of QE2 in sight, Winter asked, "When does the meltup switch into a full-fledged meltdown of the global economy? " The next FOMC meeting is on April 26-27. While there has been some debate on whether the Fed might decide at that meeting to terminate the policy of QE2 early, that debate is actually moot. By the time the Fed meets later this month, QE2 will already be at least 85% complete. I am already seeing disturbing signs of negative divergence in the stock market. Although commodity prices, which are my principal indicator, haven't keeled over yet, the combination of bearish signals from my secondary indicators and the prospect of the end of the Fed's QE2 purchases are setting the climate for substantial downside in asset prices. Reports of a new paper by a senior Saudi oil official that oil production will not rise in the next five years. Other bloggers have commented on the Saudi production puzzle. Jeff Rubin asked on April 13, 2011: Where is Saudi's excess capacity when you need it? In early March, I wrote a Qwest for Returns essay entitled Is Saudi oil production peaking? I pointed to the often cited US diplomatic cables from Wikileaks. Moreover, the blogger Satellite o'er the desert used Google Earth imagery found that the latest Haradah III development reached its production target using 60% more wells than originally projected. In the words of the late Matt Simmons, when Saudi production peaks, so will the world. That's why, despite my near term reservations about the markets, where an economic downturn would be devastating for commodity prices, I remain a long-term oil and commodity bull. The multi-million dollar F-35 stealth fighter that the Conservatives want to purchase comes with all the accoutrements of a high-tech aircraft — everything, that is, except an engine. The government will be required to provide engines for the 65 planes to be delivered by U.S. manufacturer Lockheed Martin, according to newly released Defence Department documents. Why, in the middle of an election, that the opposition parties haven't jumped all over this story is a mystery to me. The market melted down Monday and melted up Wednesday. What to make of this market action? I have some good news and bad news for the bulls. The good news is that commodity prices, which is used by my Inflation Deflation Timer Model to measure global growth and inflationary expectations, remains in an uptrend and is therefore is at an "inflation" reading. Given this signal, my inner trader remains bullish on the "risk on" trade. The bad news is my secondary indicators are not confirming the bullish signal. As an example, one of my favorite measures of risk appetite - the ratio of Consumer Discretionary stocks to Consumer Staple stocks, has rolled over indicating that investor risk aversion appears to be ascendant. This chart shows a pattern of a broken relative uptrend and a downward channel indicating a relative downtrend has begun. The same pattern can be found in a number of market leaders. Consider the chart of Goldman Sachs, for example. Other market leaders such as Google look positively sick. To add to my concern, while oil prices as measured by WTI are now above $110, the Dow Jones Transportation Average is not behaving well. The Transports staged a false breakout and is now mired at minor support despite the general market strength Wednesday. These conditions have made my inner investor extremely cautious and he has already left the bull's party. My inner trader believes in the adage that "tops are made by a process". He is staying at the party for another drink but he is standing at the door (just in case) and relying on the Timer Model to give him the signal to leave. As the market holds its breath in anticipation of the results of the upcoming FOMC meeting and various Fed luminaries voiced concerns about rising inflation, it seems that QE3 is dead and there is a risk to the Fed's zero interest rate policy (ZIRP). Notwithstanding Friday's headline CPI showed itself to be up 2.7% in the last twelve months, inflationary hysteria was further fanned when CNBC featured a story that showed the calculation, by Stadowstats.com, of CPI using the method used in 1980 to be an astounding 9.8%. How will the Fed perceived inflation? I have no idea. Given that the latest Beige Book shows an improving economy, the consensus seems to be that QE3 is off the table for now and ZIRP is threatened. The ECB, which does not have the dual mandate of the Federal Reserve, is already starting to tighten monetary policy despite the risks to the eurozone periphery. The U.S. is set to have the largest budget deficit among major developed economies and should narrow it now rather than face tough adjustments in the next two years, the International Monetary Fund said. The U.S. shortfall will reach 10.8 percent of gross domestic product this year, ahead of Japan and the U.K., the Washington-based agency said in a report released today. It estimates that President Barack Obama will need to cut the deficit by 5 percentage points of GDP in the next two fiscal years, the largest adjustment in “at least half a century,” to meet his pledge of halving it by the end of his four-year term. Throw in the bickering and horse trading over the debt ceiling - and future macro conditions are highly policy dependent. Needless to say, any fiscal tightening in the face of a fragile recovery could be deadly for the economy and markets. I wrote in November 2008, at the height of the meltdown, that conditions were highly policy dependent and that there are no investment models for all seasons. It seems that nothing has changed. Investors need to be prepared to weather this volatility, whether it is the use of tactical asset allocation such as the Inflation Deflation Timer Model, risk budgeting, or simply to raise some cash in order to keep some powder dry in preparation for better investment opportunities should the markets hit an air pocket. A qual digs very deeply into potential investments, but he can only do that with so many stocks, so he needs to have a relatively high level of conviction that he is right, since he's going to hold a pretty concentrated portfolio, say 10 or 20 stocks ... A qual needs to be careful about not making mistakes--one bad mistake in a 10-stock portfolio can get ugly!" He continued: "A quant, on the other hand, has the ability to study thousands of stocks at once, and thus can hold much more broadly diversified portfolios. Because quants hold so many stocks, ones that are even slightly misvalued may still make sense ... If you can find 500 stocks to bet on where each has a 51 percent chance of beating the market, then through diversification, the odds of your overall portfolio start to look pretty good. Asness was really re-stating Richard Grinold's Fundamental Law of Active Management which states, in effect, that you should size an investment bet according to the size of your "edge". How much should you hold of a stock ranked "sell"? Consider, for example, a large cap stock (e.g. Apple) that is ranked "sell" comprising of 12% of the weight of the benchmark (a revised NASDAQ 100). How much of it should you hold? For a fundamental investor who strenuously researches the company, the answer is a zero weight. For a quant who holds a large number of positions in his portfolio and depends on a statistical edge in stock picking, the answer is likely a non-zero weight, equal to the index weight (12%) less the size of the bet (probably between 1.5% and 3%). In the latter case of the quantitative investor, the correct answer is likely between 9.0% and 10.5%. Although there are some practical problems with the application of Grinold's Fundamental Law, the lesson still holds: bet according to the size of your edge. Philosophy: What is your edge in the market? Process: How do you implement your edge in the market? What is your edge and how do you implement it? A short century ago the US and Argentina were rivals. Both were riding the first wave of globalization at the turn of the 20th century. Both were young, dynamic nations with fertile farmlands and confident exporters. There was no individual event at which Argentina’s path was set on a permanent divergence from that of the United States of America. But there was a series of mistakes and missteps that fit a general pattern. The countries were dealt quite similar hands but played them very differently. Elitism crept in in Argentina but early America was anything but elite. Opportunities for anyone but the elite became more and more restricted in Argentina and the economy eventually stagnated. America, by contrast, embraced the ideal of a Land of Opportunity and flourished. European emigrants to Argentina had escaped a landowning aristocracy, only to ­recreate it in the New World. The similarities were more than superficial. In the 1860s and 1870s, the landowners regarded rural life and the actual practice of agriculture with disdain. Many lived refined, deracinated lives in the cities, spending their time immersed in European literature and music. The closest they came to celebrating country life was elevating polo, an aristocratised version of a rural pursuit, to a symbol of Argentine athletic elegance. Even then it took an elite form: the famous Jockey Club of Buenos Aires. By the end of the 19th century some were sending their sons to Eton. Market veteran Ned Davis puts it nicely "I think the Fed has punished savers and has put us between a rock and a hard place with QE2. It has kept the banking system liquid and helped goose stocks. But in that it has also provided juice for a commodity explosion that has hurt the world's poor, it has offset much, if not all, the good it did. 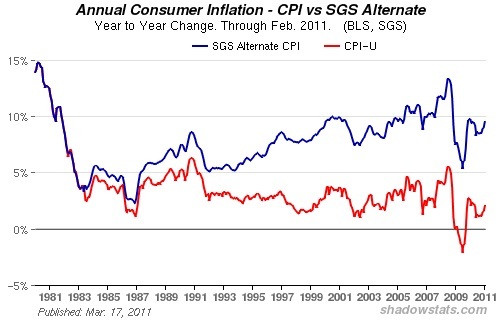 In that real money (ex inflation) matters, the situation is not nearly as favorable as most Fed watchers believe." [G]rowing inequality is the flip side of something else: shrinking opportunity. Whenever we diminish equality of opportunity, it means that we are not using some of our most valuable assets—our people—in the most productive way possible. Second, many of the distortions that lead to inequality—such as those associated with monopoly power and preferential tax treatment for special interests—undermine the efficiency of the economy. This new inequality goes on to create new distortions, undermining efficiency even further. To give just one example, far too many of our most talented young people, seeing the astronomical rewards, have gone into finance rather than into fields that would lead to a more productive and healthy economy. Here is one more nail in the coffin. During the current budget debate over the debt ceiling, Dean Baker of the "progressive" Center for Economic and Policy Research wrote that defaulting on debt is not the end of the world. He then went on to bring up the recent experience of Argentina as an example. The difference is that the US Dollar is a major reserve currency in the global economy, whereas Argentina's currency is not. Moreover, US T-Bill yields are regarded by virtually all investors as risk-free (read: default-free) rate. If the US Treasury were to default, even briefly, it would spark a tectonic shift in global finance about the perception of risk. I had dismissed the possibility of a US Treasury default as brinksmanship by the Republicans for political purposes. Baker's comments dismissing the consequences of default shows that these attitudes are becoming more bipartisan. Down that road is Argentina. As we stand on the cusp of Earnings Season, the market saw a number of important reversals last week. First of all, I have been watching the Dow Jones Transportation Average to see at what point Mr. Market gets spooked by rising oil prices. To my surprise, the Transports broke out to new recovery highs despite $110 and later a $120 Brent price. When WTI broke above $110 last week, the Transports broke down below their upside breakout level, which became a level of support. 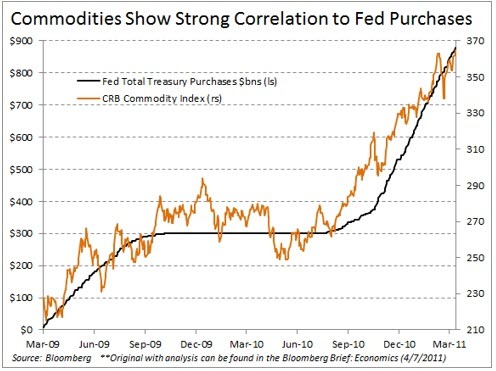 The CRB Index also broke out to new highs last week indicating commodity strength and rising inflationary expectations. Even Dr. Copper, which I had voiced concerns in the past because it was in a minor downtrend, has rallied through the downtrend line and appears to be in a sideways consolidation pattern. What to make of these reversals? What to make of these reversals? Is it a sign of rising inflationary expectations, which will certainly mean the end of QE2 and no QE3, as well as foreshadowing the end of ZIRP and rising rates? Going back to 2008, we can pretty clearly see that equities, particularly energy stocks. stalled out and rolled over weeks (in some cases months) before crude topped out at $147 a barrel. I can vividly recall traders aggressively buying energy stocks to no avail, as crude mached higher on a daily basis amid CNBC’s “Black Gold” banner on the top of the screen, following crude’s tick-by-tick fluctuations. Indeed, those traders who bought energy stocks simply because crude was going higher were in for a rude awakening over the next few months, especially if they did not have the discipline to cut losses. In other words, if energy stocks weren't rising with oil prices, then it may mean trouble for the markets. The chart below of the ratio of XLE to oil prices show precisely that condition. This looks like a commodity price blowoff to me and blowoffs don't end well. My inner investor believes that the thought of getting ready to sell in May (or earlier) continues to sound good. My inner trader is staying long but keeping very tight stops as a way of defining acceptable risk levels. The best advisers in this country already work to a fiduciary standard, but they’re not easy to spot in a financial industry where generating revenue from clients is the main objective. One approach is to look for advisers who have earned the Chartered Financial Analyst (CFA) designation. I received my CFA designation in 1989. I haven't retained much of the study material from the exams, but the one thing I do remember very vividly is the CFA Code of Ethics. I have come to recognized that in this business, all you have is your name and your reputation. If either of those are tarnished, they are tarnished forever. Consider the case of David Sokol. I have not commented about the Sokol affair because I don't have very much to add. My personal opinion is that what he did was likely not illegal, but unethical. Regardless of the legal consequences and any fallout from any investigation that may ensue, the reputation of all those involved have been damaged by this affair. Frequently, ethics training doesn't go far enough. While it is important to impart an understanding of the ethical standards to students and trainees, most organizations don't want to take the sensitive next step of involving people in discussions of ethical dilemmas. Consider, for example, this Guardian story of Wachovia being accused of laundering $378.4 billion for the Mexican drug gangs. When he looked at Wachovia, the first thing Woods noticed was a deficiency in KYC [Know Your Client] information. And among his first reports to his superiors at the bank's headquarters in Charlotte, North Carolina, were observations on a shortfall in KYC at Wachovia's operation in London, which he set about correcting, while at the same time implementing what was known as an enhanced transaction monitoring programme, gathering more information on clients whose money came through the bank's offices in the City, in sterling or euros. By August 2006, Woods had identified a number of suspicious transactions relating to casas de cambio customers in Mexico. When training people in ethics, they need to be confronted with ethical dilemmas. On one hand, you have the potential for a very large volume of business. On the other hand, the transactions have a distinct unpleasant odor to it. What do you do? I reiterate my belief that at the end of the day, all you have are your name and reputation. I have often said that the lure of free money brings out the worst in people. I think that one key area of that is the seeking of yield. I will say it plainly: Wall Street can give you whatever yield you like, if you don’t care about preservation of principal. Yield is the oldest scam in the books. Wall Street has a wide variety of yield products, and I highlight this now, because we are in a low yield environment, and they will bring these products out more often as a result. In that spirit, I wrote the Qwest Investment Management April 2011 newsletter called The price paid for stretching for yield. In the current risk-on but low-yield environment, I have seen a lot of gimmicky vehicles (that usually turn out badly) offered to investors. A great example is the buy-write strategy. Proponents point to charts below that show a buy-write index appears to have outperformed the market with lower volatility. What gets glossed over is that these strategies are required to continuously sell call options by mandate. If the market suffers a large fall, while the extra income received income received does cushion the decline, it is an uphill battle to make up the loss while having to sell call options. I have reproduced the above chart but with the indices set to 100 at the March 2009 bottom to illustrate my point. A colleague also pointed out that around 2000 and 2001, a lot of money went into buy-write strategies on the high flying TMT (Tech, Media, Telecom) stocks (e.g. Lucent, Adelphia, etc.) because the option premiums were very high. Sure, investors got extra income, but their capital in many cases went to zero. In addition, a number of years ago I spoke to a "little old lady" investor who said that she had some money in a fund that yielded 10%, when market yield were in the mid single digits. As a matter of personal interest, I called up her stockbroker and asked how it is the fund was achieving that level of yield. It turned out to be a buy-write fund that was "targeting a yield of 10%". We all aim for great things. Caveat emptor. My counsel to almost everyone is avoid complex products. If you can’t get the yield that you need through ordinary vanilla products that are transparent, then either reduce your spending or consume a little capital. Wall Street and insurance companies thrive on complexity, because you can’t price it or do comparisons. You are playing their rigged game; they may not be trying to skin you, but just nick you. I would amend that advice from "reduce your spending or consume a little capital" to focus on total return instead of just yield or income. Come and read the newsletter in its entirety, where I discuss the pros and cons of various yield enhancement strategies, not just the buy-write. Getting ready to sell in May? The economic headlines look good. Last Friday we saw the US Non-Farm Payroll report came in ahead of expectations and China's PMI rose indicating continuing growth. Stock markets rallied on the news. and the small cap Russell 2000 already in a healthy relative uptrend and breaking out to new highs relative to the market, is it time to sound the all-clear for the bull trade? Before the bulls uncork the champagne, I would urge caution on a number of fronts. First of all, the end of QE2 is just around the corner. Given the growing slew of positive economic indicators, a growing chorus of Fed governors discussing how the Fed should tighten and discussions of QE2 exit strategies, there will be no QE3 in July. So what happens to the equity markets when the stimulus of QE2, which is designed to buoy asset prices, is removed? Indeed, some of the secondary indicators that I have been watching are starting to roll over, likely in anticipation of the end of QE2. For instance, despite the continued strength in commodity prices, Dr. Copper is not showing signs of strength as it has broken down from an uptrend and is now showing signs of a minor downtrend. There are other signs that not all is right with the markets. Energy has been the recent leadership, as shown by the relative chart below. What's more, heavyweights like the Financials aren't behaving terribly well against the market. I wrote back on March 21 that we are poised for an oversold rally that is likely to last at least two weeks. Two weeks have passed and the markets have rallied. Today, secondary indicators are showing worrisome negative divergences. While this doesn't mean that equities go down right away, but these are signs that the risk-reward tradeoff is becoming increasingly unfavorable. For now, the asset Inflation Deflation Timer Model remains at the high-beta asset inflation reading. While I am cautious, I am not in bear mode as these conditions can allow these market tensions to resolve themselves through a sideways consoldation pattern. Nevertheless, the prospect of selling in May and going away is starting to sound good right now.